I realized that I haven't posted for several days. Time flies. It's all started with that little "vase project", which had a snowball effect, meaning we re-organized the whole house. There was a lot of moving furniture, changing decor, some wall painting, but not a lot of cooking. Salads came to rescue for lunch and dinner. Combine all the ingredients, and juice from one lime. Mix well, and chill in the refrigerator for minimum two hours. Serve with a lime wedge and a few cilantro leaves. This looks delicious, hearty and comforting! And here's to a successful house redesign project! This is my type of salad, filling, fresh and tasty! Oooh, Limes.... I love white bean salads... never thought about lime juice. Great idea. Comment disappeared - try again.... Love the lime juice. Never thought about using that in a white bean salad! delicious, an easy and fast meal for lunch or dinner! A fresh and tasty dish great for the summer. I love cannellini! This looks sooo good and I love the green olive touch. I love the green olives in this salad - sounds good! Hope things are ok Marina! Such simple salads are the best. Delicious, vegetarian and healthy :-) yum, yum. Agree, sometimes food speaks for itself. The food I cook is simple most of the time as a long list of ingredients intimidates me. Love the idea of adding olives to your bean salad! Delicious, summery and fresh looking! I love salads like this with sandwiches, grilled meats and on their own! Thanks! The salad is one of my favorites. I especially like your recipe with the olives I think cannellini beans are underrated when creating recipes. I think their taste and texture is wonderful. I hear you, and I think that's why it is not available in many stores (I had to order those beans). Cannellini beans have such a great yet mild taste and perfect texture to be used in so many dishes. I love bean salads (harking back to the three-bean salad of my grandmother's). this looks fantastic. Hope your project(s) got finished. look so fresh and healthy...mouthwatering! This sounds really nice, and I have home grown limes at the moment too. When you reorganize easy meals are always the right choice! This salad is the perfect choice. I love cannellini beans! I love white bean salads. You can combine the beans with so many things - I rarely make the salad the same way twice. It's particularly good mixed with tuna fish. Very nice - thanks. Thank you! 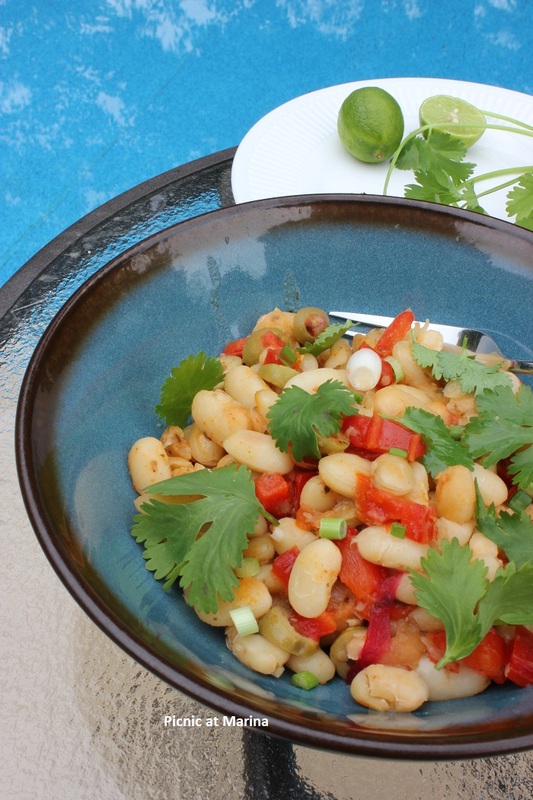 Yes, beans are versatile ingredient, healthy and delicious too!